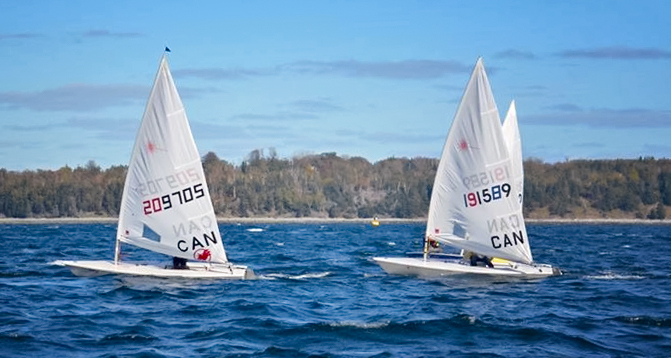 The annual Cornish Hen Regatta was hosted this year over the September 10-11 weekend at RHYC. This regatta often draws a small but competitive fleet of local racers, and is named after the prize given to competitors who podium. This year I chose to sail in full rig for a fun and more competitive experience. I ended up coming 2nd in the regatta after 5 races. I had finishes of 3, 6, 2, 4, 1 leaving me with 10 points after the drop. The conditions were excellent on the first day with 20 knots from the south west but the race committee sent us in after 1 race with concerns about the safety of some of the younger sailors. The second day brought light and shifty conditions that are common in Hamilton Harbour. Sailing in the full rig was an interesting and fulfilling experience that will help me when I move into the class full time for 2018.